I usually use this blog to talk about our homeschool and books, but since one of the things I’m up to lately with homeschooling is working for Simplify to help other people homeschool, I thought I’d talk about how fulfilling that has been so far. We’re a new business, but it’s been fun to work with such wonderful fellow homeschool moms, all of us with our own experiences and expertises. I think the most fun part has been learning to podcast. We’ve done lighter topics, like field trips, and more nuts and bolts ones, like tips for the Common App. I get to put on my headphones and hook up my mic. It keeps harkening me back to my college radio days, running the old fashioned sound board and cueing up records. It’s also just surprisingly fun. I think we’re not bad at it either. One of the tough things about homeschooling and educating for me is recognizing that all this experience I’ve had in education really amounts to something valuable and worthwhile. Before I started homeschooling, I had a degree and career in education, but it’s easy to forget, especially in the homeschool world, where people want you to do all kinds of things for free, that once you’ve been at this for a long time, that you have expertise that is valuable. And while I still love helping people out, especially in my network of friends, it’s not something that I have to give away for free. Anyway, check out our awesome podcasts here. I think our episode about middle school was especially good, and I’m currently working on a book that I hope to put out soon about middle school homeschooling and how important it is. Can you believe there are almost no books specifically about homeschooling the middle school years? Yet (and I say this constantly), if you’re going to homeschool one time of life, I really think you should make it middle school. And if you need homeschool help – someone to help you transition to more formal schooling, to apply to private school, to help you write a transcript, to figure out how to deschool, to apply to college, or anything really, then visit us at Simplify. Do you do DI? I’m always trying to spread the Destination Imagination word to people. I think it’s a great activity for homeschoolers especially because it focuses on team building and social skills, but of the real world sort and not the annoying class project sort. Basically, in DI, your team chooses a challenge (they’re different every year) and prepares a “solution” to present at the tournament. The challenges range from improv games to building robots to creating weight bearing structures to making plays to helping people. This year, my kids’ team chose a challenge where they have to create a mystery story. But, being DI, of course there’s more. It has to be set some time in history, it has to be presented on a wacky shaped stage with the audience sitting facing each other, it has to include some sort of clue that uses engineering of some kind, and the kids won’t know the ending until they start the skit so they had to prepare multiple endings. That’s the sort of thing you do in DI. There’s one other piece of competition in DI and that’s the Instant Challenge. An Instant Challenge happens super fast. Kids are given just a few minutes to work out a “solution” to this one and it can be anything. Some are performances, like make a skit about a road trip where you meet three monsters or make a skit where one person can’t talk and everyone has to figure out why. Others are tasks and the tasks can be anything. There’s a lot of bridge building and tower building with things like paper cups and chenille sticks, but I’ve seen task challenges were you have to move things around or create secret codes or float boats or send projectiles across a room. Other challenges ask kids to make something, like a painting or a building or anything really, and then use in somehow in a skit. Instant challenges are great for teamwork and practicing quick thinking. Even if you don’t do DI, you can do Instant Challenges. They could be great for starting off other group meetings like scout troops or robotics clubs. They could be a good get to know you or fun challenge in a class or co-op. They could make an interesting party game. Yeah, I know, I’m a DI crazy person, but I do sort of think it’s true. Instant Challenges are wacky and fun. Here’s some of my favorite sources for IC’s (aka Instant Challenges). Some of these collections include old challenges really used at tournaments and others are just ones created for teams to practice. None of these documents have names so I had to give them random ones. A warning to readers. This is sort of a personal exploration post about a lot of things. I rarely post much about politics. One of the things I enjoy about the online homeschooling community is how it gives me a peek into different perspectives on the world. But every once in awhile, I share some of mine beyond simply the practical stuff, the parenting trials, and the books we’re reading. I promise, next post about math instead. Last week, I listened to This American Life’s two part series about integration in schools today called “The Problem We All Live With.” I think a lot of homeschoolers only pay attention to school education news in limited doses. Many of us have had bad experiences with schools and know that even supposedly good education news can rile us up. This has been true for me at times as well, but I’m also interested in the education world in general. I have strong feelings and opinions from when I used to teach in schools. While sometimes school stories do make me want to gnash my teeth, I’m drawn into them often. This story, about the increasing segregation in schools and the lack of movement toward integration overall, was depressing and teeth gnashing to say the least. It followed two districts where integration is happening and the difficulties of making it work in the face of angry parents. The second district had a story that was especially familiar to me. You see, during most of my youth, I attended schools that were much more integrated than most apparently are, in part because of a magnet program that drew mostly white suburban kids to mostly black city schools, just like the program profiled in the second part of the story. It was, for me, a great experience. I can remember clearly before heading off to middle school my mother saying to me that one of the things I needed to think about was that I would need to be comfortable being in the minority as a white student. I don’t remember that being an issue to me. On the contrary, I’m so glad I had that experience. It was not always as rosy a racial harmony picture as all that, but it was, overall, a positive experience for me. A few things make this difficult to reflect upon. First and foremost, we live in the inner city in a very racially diverse neighborhood. While the schools weren’t good when we first came here, they’ve improved greatly. If I wanted to, I could enter the charter lottery and send my kids to one of several diverse urban schools that are really, all in all, not bad places. And I’m all too aware that, whether they mean to or not, white parents have been the driving force resegregating schools, in part by moving but also in part by choosing educational alternatives to keep their kids away from what is seen as the wrong kind of culture in schools. One of those alternatives is homeschooling. Homeschooling among minority groups is growing, in part to escape the segregated attitudes in schools. Recently there was an excellent article about the growth of African-American homeschooling in my city and several others about the rise nationwide. However, it’s still disproportionately white. And the tribal mentality in homeschooling means that sometimes different religious groups don’t even mix, much less different racial groups. I’m also sadly aware that the racism in some elements of homeschooling are much closer to the surface than in other places. Some of the most popular homeschool programs include racist language, read older literature that is filled with racial stereotypes, and filter American history through a providential lens, one that emphasizes that Europeans (and not anyone else) were given this country by God. That’s not why we chose homeschooling. We avoid those sorts of materials. I’d homeschool if we lived in a ritzy suburb or a rural area or even a foreign country. I decided to homeschool years before we moved here, years before we had kids even. Some homeschoolers decide on this path after seeing their local school or even after experiencing its negative impact on their child. But we chose it because of the benefits of learning at home, not because of the negatives of being in school. But, by doing so, we’ve removed our kids from their environment in many ways. There are no other homeschoolers my kids’ age in walking distance the way school friends would be. We travel, sometimes half an hour or more, to see friends, mostly in the suburbs. There is some diversity in our group of extended friends, but mostly it’s very white. It does not reflect the neighborhood around my kids. They have, in the last year or two, started to make more neighborhood friends simply by being old enough and confident enough to be outside at the parks and strike up friendships. Still, when I reflect on this, it makes me uncomfortable, to say the least, that we leave our neighborhood, where the kids are more than half black and Latino, to see our friends, who are almost all white. However, I get that few parents want to sacrifice their ideals about society for their child’s education. When I think about Civil Rights parents, willing to send their kids into atmospheres of hatred and derision, I’m constantly awed and astounded by how difficult that must have been. I made education decisions for my kids, not for society as a whole. I don’t plan to change even though, I’m aware that for society as a whole to shift, sometimes people have to make decisions that are not great for them in the short run in order to make a better future in the long run. Sending my kids to school wouldn’t change much, but when everyone makes the decision to opt out, for whatever reason, that’s bad for the people who don’t have the resources to opt out, whether by moving away, starting a private school, or homeschooling. There’s no easy answers, but it bothers me sometimes that homeschoolers like to bury their heads in the sand about some of these hard truths. We would like it to be simple that we’ve made the right decisions for our kids and would like to pretend that dropping out, tuning out, and isolating ourselves is without broader consequences both for us and society. Like I said, we homeschool, I believe in homeschooling for all sorts of families, and I don’t plan to change. But listening to those two stories is a heavy weight in a way. The only silver lining, I hope, is that schools aren’t always much better when it comes to teaching tolerance and valuing diversity. By homeschooling, I can expose my kids to more diverse authors and literature than they might meet in schools as well as a more well-rounded history of the world as a whole. At least, that’s what I hope. So I strive to teach my kids to recognize their privileges in the world, including the privilege of being educated at home. Hello, dear readers. I’ve been getting more hits in the last few weeks and it gave me a mild kick in the rear to clean up the blog a little bit. I don’t think I’ve looked at the links in a year (or two or three…) and I had not updated our curriculum section above. But that’s all updated now. Specifically, you can read about our wrapping up of fifth grade (that’s currently) and our loose upcoming plans for sixth grade in the fall. I’m sure I’ll have more thoughts on that in the near future (eek! middle school!). In the meantime, if you have a favorite book blog you think I should be reading, I realize I have fallen behind on keeping up with those, so please suggest it! 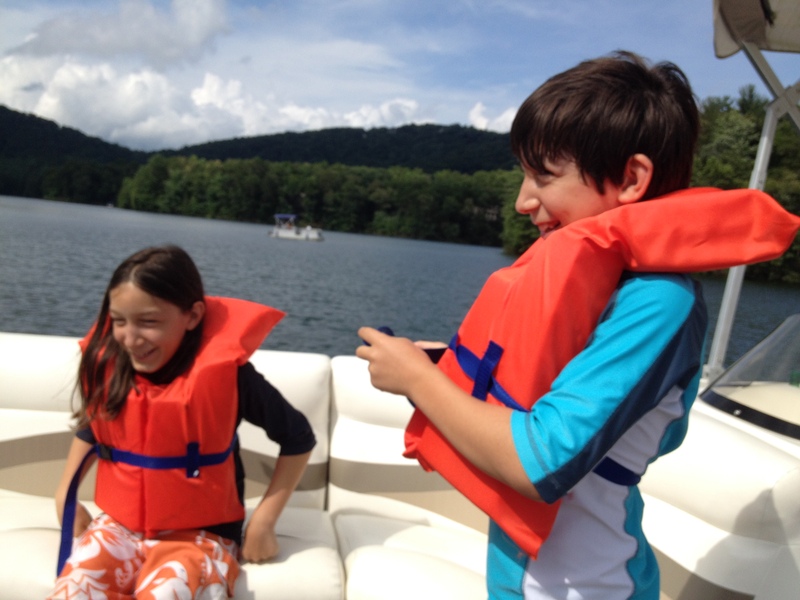 We started back to school after a break of about a month for summer camp, cousin camp, and a trip to see relatives. I’m sure I’ll post more soon, but in the meantime, enjoy this totally unrelated to anything picture of the boys enjoying summer to its fullest. I hope you’re all milking it for everything it can give as well. It looks so innocuous, doesn’t it? Even positive. But I find this Venn diagram and most of the others I see circulated on social media like it to be a harmful thing. It’s not the way I want to frame my life and definitely not a trap I want my kids to fall into. Some version of this diagram – sometimes with only three circles, often with different graphic design – comes around every month or two on my various feeds, shared by people whose ideas I usually think are pretty positive and open-minded. It seems like a great idea. You’re asking people to look at their lives and think about how to bring different pieces together, to find meaning, to help others, to think about what they do well. It sounds great. The problem is that this graph is not achievable for a huge number of people. Getting paid to do something is outside your control to a large extent. Your passion may be something that simply isn’t marketable or easily monetized. And your gifts may not include monetizing your passions. In fact, monetizing one’s passions has a cost for that passion for many people, a cost that some people are uncomfortable paying. So where are you stuck then? Supposedly without a purpose. It surprises me that I’ve seen so many homeschool moms share this graph because we all have a calling to educate our children. No one is willing to pay us for it, yet we persist. According to this, we have no purpose in our lives. In fact, we’re not even allowed to call education our vocation because according to the Venn diagram, that requires money. I find an incredible amount of purpose in my life teaching my kids. At this moment, while I do have other things in my life, teaching my children is my driving force. It’s the thing I do all day, the thing that brings me meaning and fulfillment. Of course, those “other things” are important too. I write, I see friends, I read, I make art. Those things are also an important piece of my purpose and fulfillment in life. I think this graph is a trap that we build for people in our society. We tell each other that the only path to meaningful lives is to find a career that will do everything for us, a career that we love, that gives us purpose and a comfortable life. We tell ourselves that unless we are paid in money for something, that is has no value. Since others are who pays us, we allow others to determine the value of our work on every level. For a few people, life does work out that way. But for most people I know, they may like their jobs and even find some level of purpose in them, but it’s through their creating unpaid art, coaching their kids’ sports team, passionately discussing books with friends, volunteering at a local charity, sustaining their church or other such work that they actually find a huge part of their fulfillment. The job is what lets them live comfortably and may even be enjoyable work, but it isn’t what brings everyone purpose. That’s the “other things.” And this graph devalues them. It says they’re not important to the real picture. The graph says that shouldn’t be the goal. It’s settling for something lesser. You see, I’ve also seen people struggle with this and feel like they can’t be happy unless their job is what brings them happiness. It’s looking for paid work to bring us all the answers. Sometimes it can, but sometimes the answers are in unpaid work, family, community, or hobbies. We make it harder for people to find that sense of purpose when we tell them that everything must come together and they should get paid for it. Money is important. There’s no getting around that. If you don’t have enough money to provide basic food and shelter, then you’re never going to have the level of happiness that you need. But if you can achieve that level of basic financial security, I think it’s possible to find purpose in your life and a job doesn’t have to be the source of that purpose. So I say if being a lawyer is what brings you purpose, then great. if playing role playing games is what brings you purpose, that’s great too. If volunteering at a food bank is what brings you purpose that’s great. If baking fabulous cakes for everyone’s birthday is what brings you purpose, don’t feel like you have to open your own bakery or it isn’t really purpose. If teaching your children is what brings you purpose, then that is purpose, even if no one is paying you. If you get purpose from a bunch of different, unrelated things, that’s great too. Your job doesn’t have to do everything for you. I want my kids to grow up knowing this. Knowing that if they’re out of work for a year or stuck in a job they dislike but can’t leave for awhile when they grow up, it doesn’t mean they can’t look for fulfillment and meaning in other places. It doesn’t have to mean they have no purpose. If they choose to do a job mostly for the money, it doesn’t mean they aren’t allowed to look for meaning through arts or writing or dance or acting. I want them to know that giving away your time can be more fulfilling and purpose filled than a paying job. And that the world needs people who make money and carefully give it away. I want them to see that this is only one model for living a happy live. 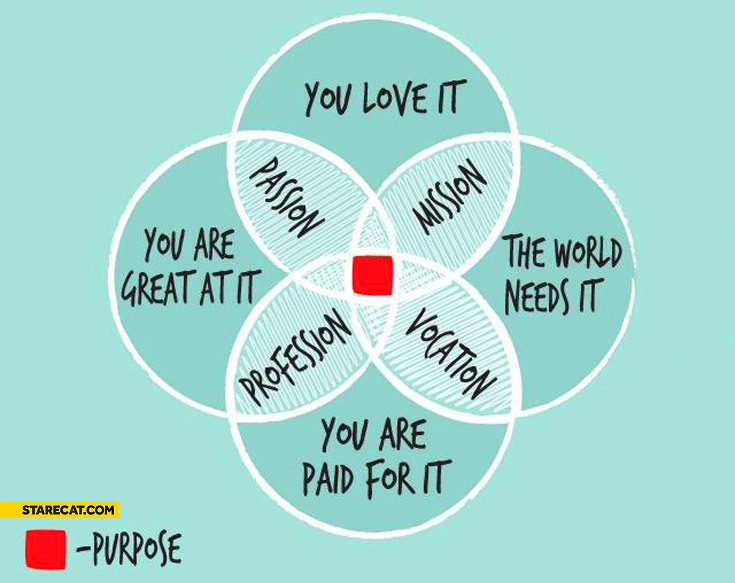 It’s not the only model and certainly not the only way to find purpose.